Cutco was created as product for Wear-Ever Aluminum, which at the time was a division of ALCOA. The company evolved from there, eventually adding its signature Wedge-Lock handle and placing the Double-D® recessed edge on some of its knives. Two things that have never changed are its commitment to fine craftsmanship and The Forever Guarantee. 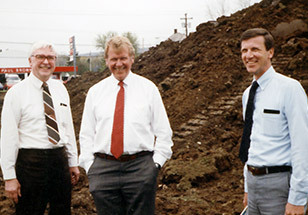 The company as it exists today was formed in 1982 following a management buyout that took the company private. It was a leap of faith for the management team that bought the company, but it was that moment that secured Cutco’s future for generations to come. The name Cutco comes from the name of a company once owned by Alcoa, Cooking UTensil COmpany. 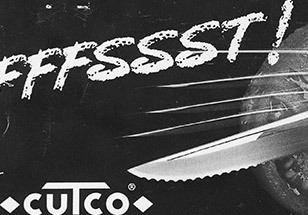 Cutco Cutlery Corp. Manufacturer of Cutco since 1949 Olean, N.Y.
Vector Marketing Corp. Marketer of Cutco through in-home demonstrations. Olean, N.Y.
Cutco at Home Marketer of Cutco through in-home socials. Olean, N.Y.
Cutco Stores, Inc. Exclusive Cutco retail stores Olean, N.Y.
KA-BAR Knives, Inc. Maker of quality sporting knives Olean, N.Y. Giving back is ingrained in Cutco’s culture. The Corporate Mission Statement makes a point of calling out a commitment to social responsibility and making a positive difference. With a focus on health, education, and community-based charities, Cutco Corporation and its subsidiaries hope to make our communities a better place to live and work. Charitable support has included hospitals, hunger causes, colleges and universities, academic programs, primary education programs and disaster relief. Saturday (Memorial Day through Christmas) 10 a.m. to 4 p.m.